My first partner at work is expecting a child with his new wife. I wanted to make them a quilt for the baby, so I asked the gender and the nursery colors and theme. He told me that they were having a boy and that the nursery was going to be decorated in yellow and grey chevrons. Talk about a score! I have been wanting to do a chevron quilt for the longest! 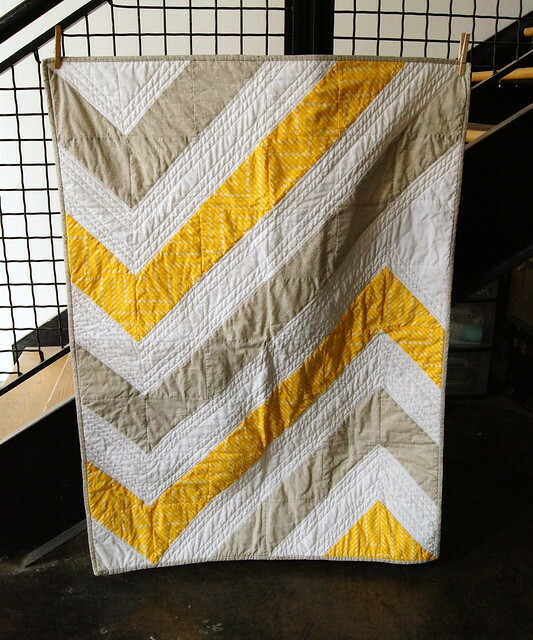 I found a really cool tutorial at Generation Q that was a spin on the traditional chevron quilt. I decided to change it up and use the same fabrics for entire lines. I didn’t have enough yellow so I went to one of the LQS to find a good match. I was hoping to find some yellow chevrons but they didn’t have any. Instead, I found a really cool Freespirit print. 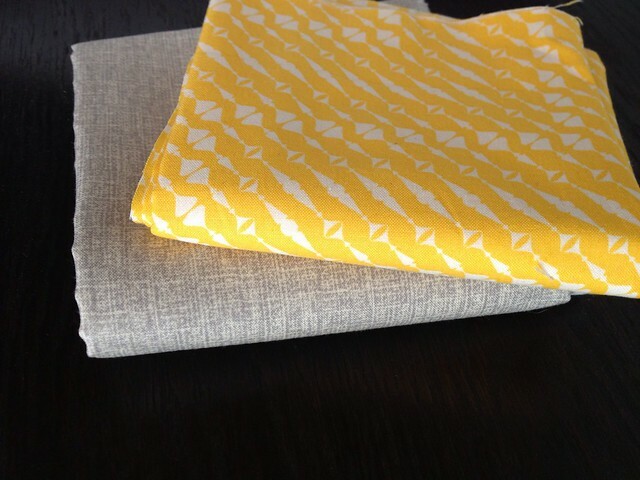 Since I was already there, I was like, “hmmm…it wouldn’t hurt to look for a coordinating grey…” Of course I found one. I loved it so much I had to buy extra so I could use it on other projects. It looks like a linen from far away but is a quilting cotton, much easier to sew on. It’s Mod-Century by Moda. I took all of my new fabric with me to my quilting retreat and got to work on it the first day I was there. I had it done by dinner. Seriously this was the quickest and easiest quilt I have ever done. Super cute too! This is the cutest and nicest gift eva! Love it! How cute! That should fit in perfectly with his nursery! Adorable quilt! I love how the chevrons are set & the colors are just perfect! Cute and quick! That's a win-win!